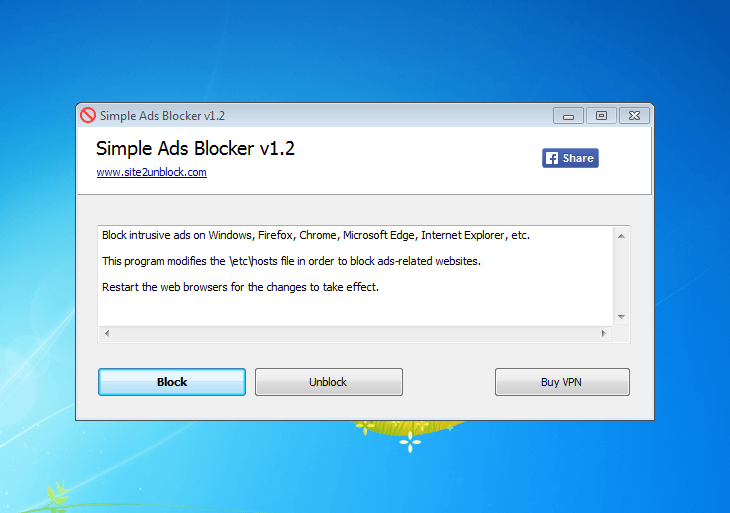 Simple Ads Blocker is a simple Windows OS software application that can block many intrusive ads (advertisements) on Windows Apps and on popular web browsers (like Edge, Firefox, Internet Explorer, Chrome, Opera) by modifying the Windows \etc\hosts file. Block annoying ads on Skype, Office Starter, Microsoft Edge, Start Menu, Lock-Screen, etc. The usage is very easy, just run the program and click on "Block" button, you should restart the web browser and the Windows apps for the changes to take effect, that's all. Works on all version of Microsoft Windows, from XP to Windows 10 32\64-bit.